Hello and Happy Thursday! We've almost made it to Friday and that is always a good thing! 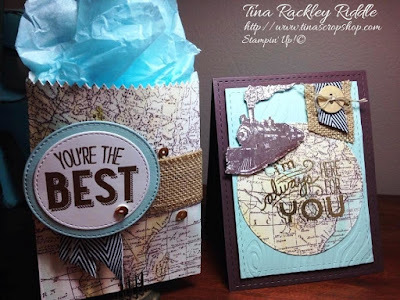 Since it's the 2nd Thursday of the month it's time for another One Stamp At a Time Blog Hop. This month, it's all about Father's Day or Masculine Cards. If you have already been hopping then you should have landed from Kim Smith's Blog. Kim is new to our Blog Hop but has some amazing work so I hope you left her some love on her page to make her feel welcome! If you've followed me at all, you are probably not one bit surprised that I pulled out the Traveler stamp set for my masculine card. It really is my "go to" masculine card set! I started with a 11" x 4 1/4" card base in Chocolate Chip. I scored the front with my MFT stitched rectangles set. I then cut a layer of Pool Party with a smaller stiched rectangle and dry embossed it in a woodgrain embossing folder. I cut a piece of watercolor paper and stamped the world map onto it with Stazon Timber Brown Ink. Once dry, I used my Aqua Markers to watercolor the map in with my Pool Party, Crumb Cake, and Old Olive Ink Pads. Once I finished my watercoloring, I used a heat tool to dry it and then cut a stitched circle out of the Map. 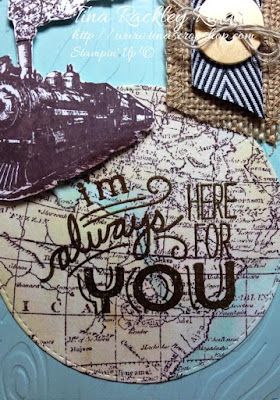 I then heat embossed the sentiment from the Friendly Wishes Stamp Set with Gold embossing powder on the Map. I glued my circle onto the lower half of the woodgrain background layer. 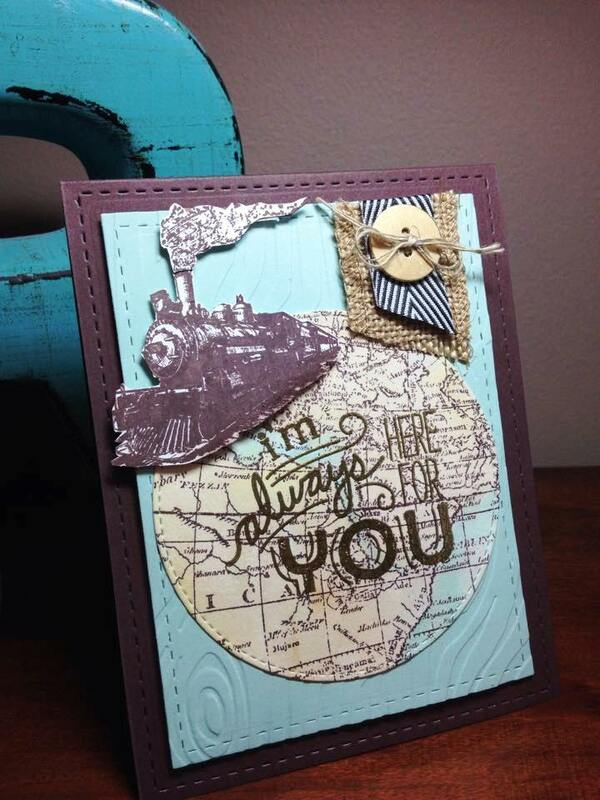 I stamped the train on Whisper White cardstock, fussy cut it, and adhered with dimensionals. In the upper right corner I put a layer of burlap ribbon and a small piece of Chocolate Chip Chevron Ribbon from my huge stash. I stapled the ribbon to the upper right of the card. I then threaded a basic gold button with linen thread and adhered it the ribbon with glue dots. For my second project I made a mini treat bag gift card holder. I used a large sheet of watercolor paper and stamped the world map on it twice side by side with Stazon Timber Brown ink. I then watercolored using my aqua painters with the same inks that I used on the map on my card. I dried the paper off with my heat tool and then cut out the mini treat bag with my die and glued it together. I glued a piece of burlap ribbon around the bag and stapled on a couple of pieces of Chocolate Chip Chevron ribbon and strand of linen thread to the left side of the burlap. I heat embossed another of the sentiments from the Friendly Wishes Stamp set in gold. I cut that out with a small stitched circle die and cut a larger stitched circle in Pool Party. I glued the sentiment onto the blue circle and then adhered it to the burlap ribbon with glue dots. I added a few gold Pink Posh sequins because it needed a little something :) Oh and one of my favorite parts of this little bag is that I used My Paper Pumpkin blue tissue paper for the inside of it! Love the card and project Tina. I need to try the stitching on some of my projects! I love your projects. Map paper is my absolute favorite. This is amazing! I just may have to CASE this! Gorgeous Tina! I love your wood-grained embossed AND stitched mat, what a great idea. And creating a gift bag from a large sheet of watercolor paper, I'm loving that too. you always make such beautiful cards and projets! this is another beautiful one!